Two-factor authentication (2FA) adds another layer of security to your account access. 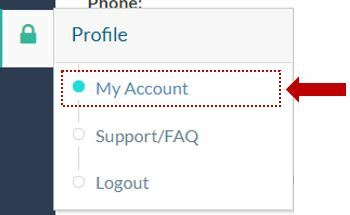 Each ContactPigeon account can set up two-factor authentication from your profile page. Two Factor Authentication provides a second step in the log-in process that requires not only a password and username but also another piece of information that only the specified user has access to. This provides additional account security as the 2FA makes it harder for potential intruders to gain access to the account and steal any personal data. With 2FA enabled, you will enter your username and password per usual during the login. Once you enter the password, ContactPigeon will send you a special verification code via email, to be entered in the last step of the verification process. Each code is unique for a short period of time, and can only be used once to login in. 1. Log in to ContactPigeon. Under the Profile icon within the left menu bar, select "My Account". 2. Under the Optional 2 step authentication, enter the email you would like to receive the verification code for logging in. 3. Hit "Save" to activate the 2FA. Please note: The email used for 2FA will also be the email address for password recovery. So, it's important to make sure you enter a valid email address here to successfully access your ContactPigeon account in the future. To turn off 2FA for your account, follow the steps below. 2. Under the Optional 2 step authentication, remove the email within the "Pin email" field. Make sure the pin email field is blank. 3. Hit "Save" to disable the 2FA.